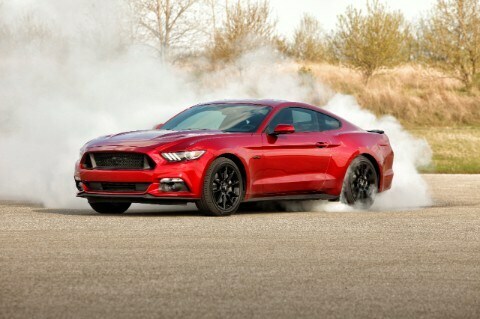 Meet the 2016 Ford Mustang, a dynamically-styled and slightly-renovated car that will take you to your destination. For 2016 the Mustang did get its new features: GT models now get secondary turn signals on the hood vents. There are some new colors available for the Mustang, and if you want you can get the car with a black roof panel and/or over-the-top racing stripes on GT, GT Premium, EcoBoost and EcoBoost Premium models. Finally, you can have SYNC 3 with a nice graphical interface, a smartphone-like touchscreen and conversational voice recognition. 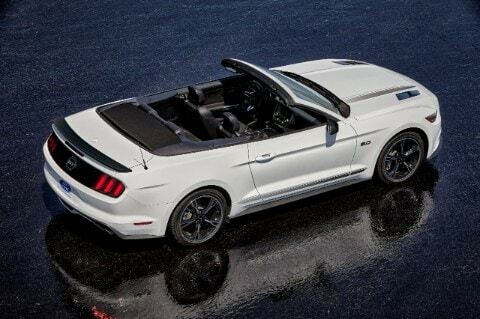 The 2016 Mustang is assembled at Flat Rock Assembly Plant in Flat Rock, Michigan (not too far away from here! ), and has a manufacturer's suggested retail price (MSRP) that starts at $23,800. There may be a $900 destination, delivery and tax fee. The 2016 Ford Mustang performs especially well on the highway with any one of its engines, but is also fashionable inside and out. Continue reading to learn more about the outstanding 2016 Ford Mustang! You may have a 3.7-liter V-6 engine that provides up to 300 horsepower and 280 lb-ft of torque, a 5.0-liter V-8 engine with up to 435 horsepower and 400 lb-ft of torque, or a 2.3-liter EcoBoost engine that may give you 310 horsepower and 320 lb-ft of torque. The EcoBoost engine has switchable engine mounts that become stiff to get maximum power to the back wheels for excellent rear-wheel drive capability. The engine mounts can also become soft for a ride free of vibrations. You can choose from two different transmissions: a six-speed SelectShift automatic, or a six-speed manual. The 2016 Mustang is fuel-efficient because it provides up to 32 miles per gallon (mpg) highway, 21 mpg city and 25 mpg combined. You can power this vehicle on regular, unleaded gas for your convenience and wallet's sake. The highway and city ranges in miles for a tank of gas are 448 and 272, respectively. You will have a 16-gallon gas tank to bring you those distances! There is electric power steering for the 2016 Mustang. If you would like, you can power the vehicle through cruise control when you are driving on highways or other straight roads, so then you will not have to deal with steering. Cruise controls are located on the steering wheel. Like you will have cruise controls on the steering wheel, you will also have audio controls on the steering wheel. Ten exterior colors are available for this car that will likely provide occupants with cloth seating. Convertible and fastback are two body styles available for the 2016 Ford Mustang with its steel body and aluminum hood. There are a few available packages to choose from to enhance the Mustang's look: the Pony, California Special and Black Accent. 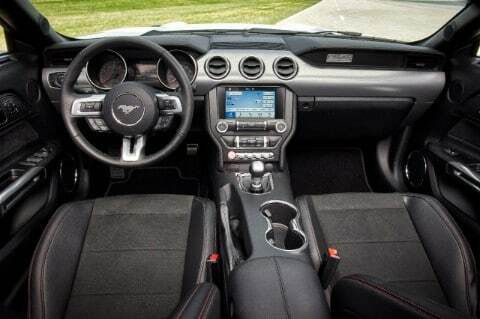 The Mustang's available SYNC 3 system has an 8-inch center LCD touchscreen with some swiping and pinch-to-zoom capabilities and AppLink. Bluetooth is available to help you stay connected on the drive. The car comes with a collapsible steering column. The 2016 Mustang comfortably seats up to four people. The driver can enjoy the luxury of a leather steering wheel, and dual-illuminating vanity mirrors. Passengers in the back can expect up to 30.6 inches of leg room. When all seats are in their places, you will have up to 13.5 cubic feet for your cargo capacity. There are cupholders in the front for passengers' convenience. How much room does the Mustang need to turn around in a circle? The Mustang's turning diameter is 36.5 feet. Will I have all-season tires? Yes, so you will feel confident driving through the winter weather! Do you have service coupons? Yes! Click for our service coupons! The basic warranty for the 2016 Mustang is for three years/36,000 miles. Dusk-sensing headlamps will turn on automatically when it begins to get dark out. The headlamps will also be auto delay-off ones. A rearview camera will help you see behind you while driving on the street, and will come in especially handy when you may be backing into a parking space or driveway. Tire-pressure monitoring will alert you when you should stop to fill up your tires to avoid a potentially-flat one. The 2016 Ford Mustang received an overall five-star crash rating from the National Highway Traffic Safety Administration. The car received five-star ratings in frontal, side and rollover testing. Eight different airbags, which include a passenger knee unit, will help you out in an accident. You will have AdvanceTrac electronic stability control. You may have 911 Assist to help you out in an emergency. Come down here today to see the 2016 Ford Mustang, give it a test drive, and see how it could be for you! We are located at 333 East Genesee Street in Lapeer. You can also give us a call at (877) 859-5286 for more information on the super 2016 Ford Mustang!